Can you get tax benefits for charitable contributions? As the filing season for 2018 tax returns reaches a peak, many people will learn that they’re no longer itemizing deductions. The Tax Cuts and Jobs Act of 2017 (TCJA) placed limits on some deductions and increased the standard deduction significantly, so most taxpayers are taking the standard deduction, rather than itemizing. Taxpayers may have to call their IRA custodian and speak to a designated person who is familiar with qualified charitable distributions. 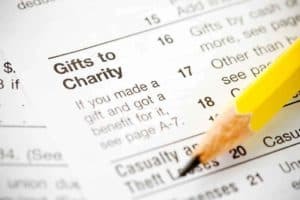 Charitable recipients can be named, along with their mailing addresses. Securities might have to be sold, if the QCD is to be made in cash, and a form might have to be signed by the IRA owner for each charity, permitting the QCD. Keep in mind that a distribution will only be a QCD if the entire distribution meets the requirements for a charitable contribution deduction, such as a charity’s eligibility under Section 501(c)(3) of the tax code and substantiation requirements. Qualified charitable distributions can’t be sent to donor-advised funds. Qualified charitable distributions can come from most types of IRAs, including rollover IRAs and inherited IRAs, other than “ongoing” simplified employee pension (SEP) IRAs or savings incentive match for employees (SIMPLE) IRAs. For this purpose, a SEP IRA or a SIMPLE IRA is treated as ongoing if it is maintained under an employer arrangement under which an employer contribution is made for the plan year ending with or within the IRA owner’s taxable year in which the charitable contributions would be made. Following the IRS’ position, some IRA custodians will permit a QCD from a SEP or SIMPLE IRA for a given year if no contribution has been made to the plan that year. View the tax calendar here. Batley CPA is available to answer any questions you may have about qualified charitable distributions. View original article on qualified charitable distributions here.